Now see daily posts on our Facebook page with events, photos and shared theatre information from around the world curated by our Social Media Editor. 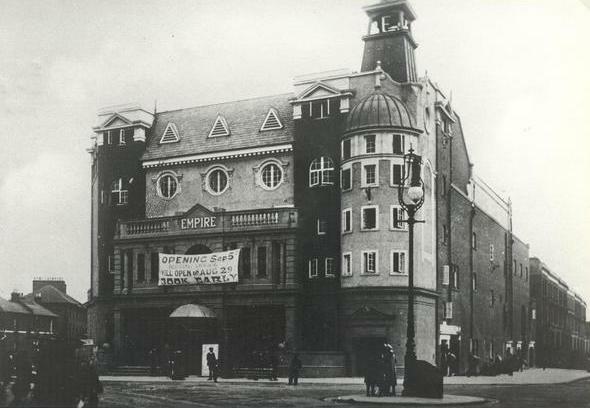 Also view our latest posts on Twitter, and scroll down the page below for lots more stories about theatres. Economic contribution of arts and culture artscouncil.org.uk/economic-c… via @ace_national it’s a 2017 report however an interesting read. English National Opera at the London Coliseum plan to alter the front doors after audiences said that they felt that they were ‘excluding’ reports the Sunday Telegraph. The doors were originally installed in 1904 at Frank Matcham’s largest built theatre and are part its Grade I heritage listing, so the company are looking at their options. They are also going to lift the Foyer carpet to reveal the original mosaic floor. Work to restore Belfast’s Grand Opera House, one of Northern Ireland’s most iconic buildings, will begin in the New Year as the Theatre announces support from The National Lottery Heritage Fund. 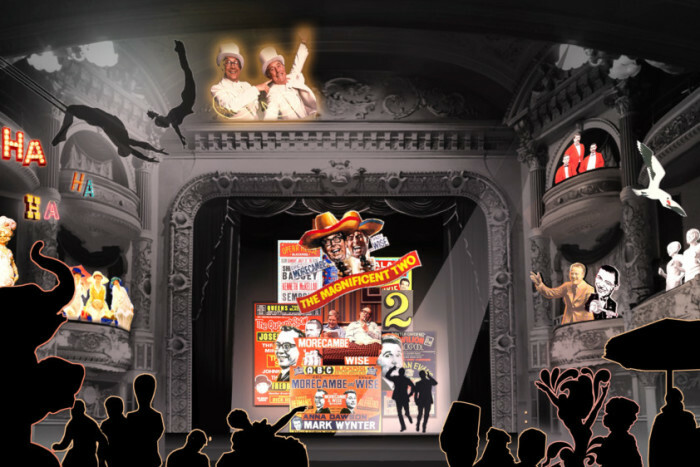 Starting in January 2020 the ten-month project will focus on the restoration of the auditorium designed by the most prolific theatre architect of the Victorian era, Frank Matcham. See the details in their press release. Matcham’s Blackpool Grand, which is celebrating its 125th year, featured on BBC Television’s Inside Out – North West programme on 11th March and is now available on iPlayer via this link and go to 20 minutes in; account sign-in may be required. 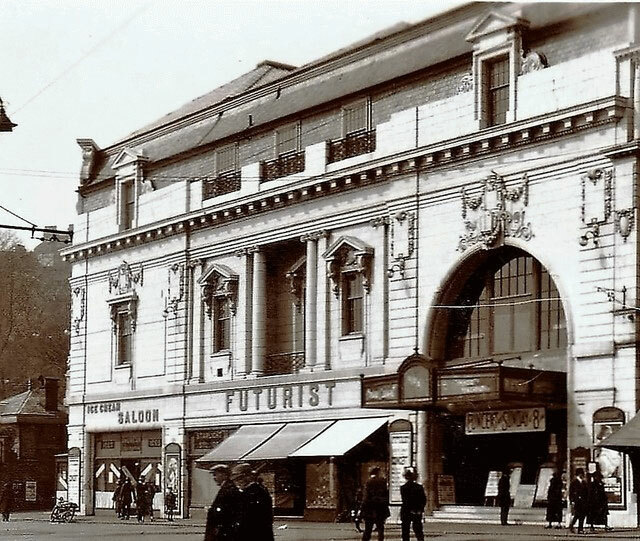 The public consultation by Brighton Hippodrome’s owner of his plan for this iconic Grade II* theatre is due this month (update – now March 2019). The circus/theatre is still closed and awaiting a sympathetic reawakening, with the Theatres Trust keeping a watch on developments; see their page and excellent local campaign video here. The latest planning application for a block of flats on the Crown at Eccles in Greater Manchester goes before the local planning committee on 7th February. Campaign Facebook page here and Theatres Trust entry here. It is a credit to the local community that they fight on despite increasing dereliction by neglect. Brighton’s Save Our Hippodrome campaign have a clip from the ITV local news featuring an interview with the owner of the long closed Hippodrome. Watch it here. The Theatres Trust has launched its 2019 Theatre Buildings at Risk list to continued concern about the loss to our cultural and community lives that this represents. Heading the list still, is Brighton Hippodrome, where the city is awaiting the announcement by the developer of his proposals. Three theatres have been added to this year’s list, including London’s Tottenham Palace, and seven theatres have been removed, some for positive results, but sadly some lost. Matcham’s Grade II* Grand is celebrating 125 years this year, a stupendous achievement since it narrowly escaped demolition in 1973 but for a campaign by local people to save it at that time of carnage for theatre buildings in England. 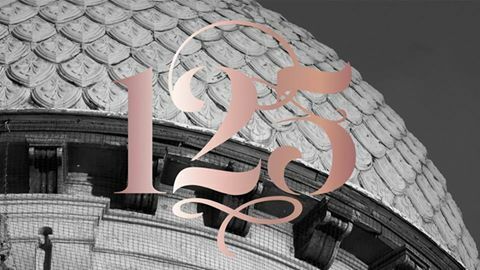 Their ‘125 Celebration Open Day’ will be free of charge and there will be a number of other events listed on their website here. There are some anniversaries coming up this year for Matcham theatres with celebratory events well worth looking out for. 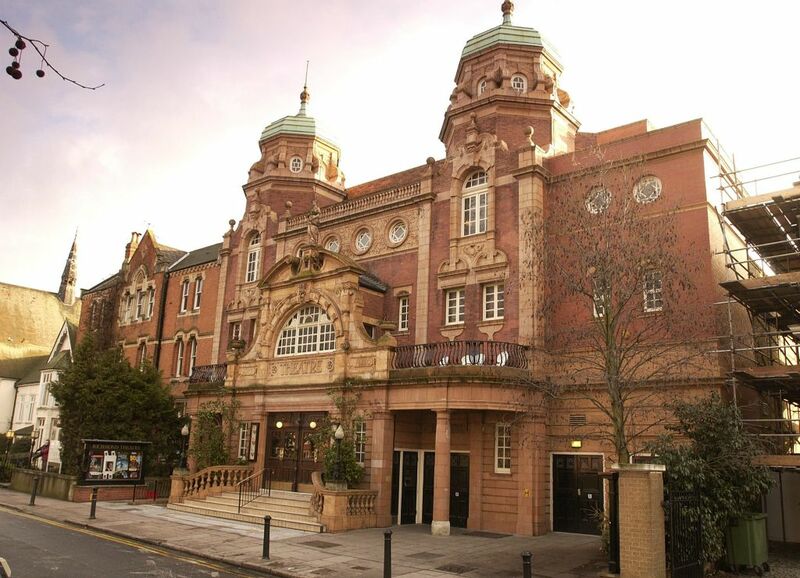 The Grade II* listed Richmond Theatre will be 120 years in performance and this year’s West London History conference on Saturday 30 March is on the theme of Entertainment in South & West London. Find out more on the Richmond Local History Society website page here. Then in September a talk will feature in conjunction with the Richmond Society – details here. It gives us great pleasure to announce that Lady Anne Dodd has agreed to continue as a Patron of the Frank Matcham Society in her husband’s memory and to keep up links with Matcham theatres. We will be returning to Liverpool for our 2019 AGM and events in May. The Stage newspaper is reporting that the Ambassador’s sale to Delfont Mackintosh, which would have enabled the creation of the Sondheim stage, has been outbid by Ambassador Theatre Group (ATG). This will probably result in cancellation of the Sondheim project, which was somewhat controversial because of the major internal alterations planned for the Sprague theatre, but which was supported by the Theatres Trust. More details will no doubt emerge in due course. Burnley Empire Theatre Trust (BETT) has now been able to purchase the theatre following the sale announcement thanks to support from the Theatres Trust, National Trust and our VP David Wilmore of Theatresearch. 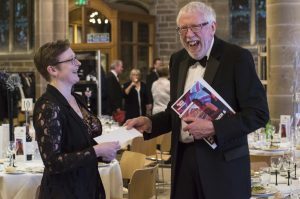 With the generosity of an anonymous donor and the Duchy of Lancaster, who honoured their original offer to sell to the Trust, Burnley Empire Limited has been able to take up the Duchy’s kind offer. This Grade II Listed building dates from 1894 with the auditorium reconstructed by Bertie Crewe in 1911. 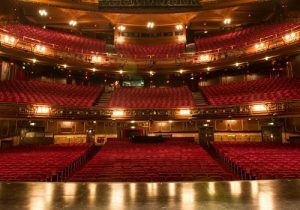 It has been on the Theatres Trust Theatres At Risk Register many years whilst BETT campaigned for its survival and re-use. More information in the press release here. Brighton’s Old Town Conservation Plan, which includes some important provisions for the Hippodrome to return to theatre, has been adopted by the City authorities. 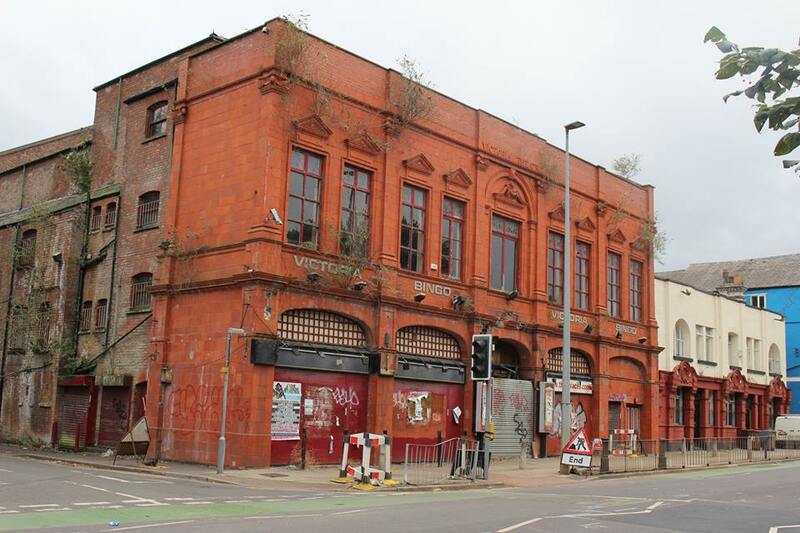 It should result in the whole area revival and improve the present scruffy and graffitied Middle Street with the historic synagogue at one end and the theatre at the other. 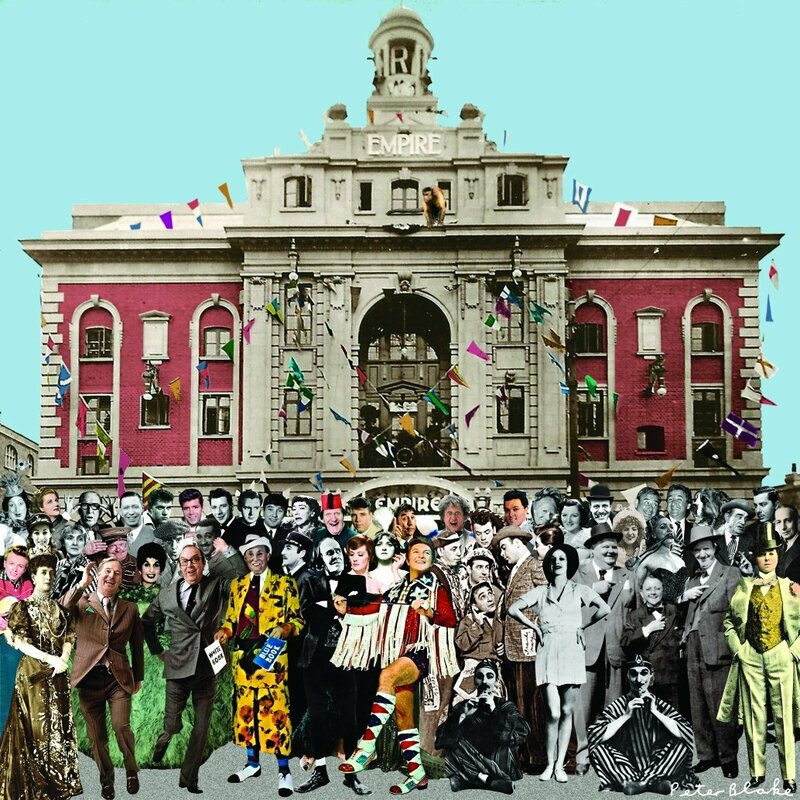 Over a thousand supporters of the campaign to bring back live performance to South London’s Streatham Hill Theatre spontaneously met outside the extraordinary theatre building, closed on bingo and with the owners challenging the Asset of Community Value designation granted by Lambeth, the worry being that it could go for redevelopment as has the Gaumont Palace cine/variety theatre alongside it – view the video. Manchester’s KinoFestival sees performance return to the ex BBC Hulme Playhouse, albeit on film. We saw it last year before the church, which had occupied it and done some restoration, abruptly went into administration putting the fine little theatre, twinned with the adjacent empty Hulme Hippodrome, in jeopardy. The film festival organisers have installed a big screen and projection facilities, getting underway Saturday 24 November details and tickets here. Supporters of South London’s Streatham Hill Theatre, a sleeping beauty now that bingo has ceased, are campaigning vigorously to prevent it falling into the hands of developers. View the video on their Facebook page here. 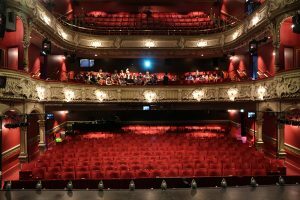 The Institution of Structural Engineers has awarded their 2018 prize for the design and construction of the complex structural alterations to the Grade II listed Queen’s theatre in London’s Shaftesbury Avenue. The details of the citation are here. The Burnley Empire Theatre Trust have just received another setback with the news that the theatre is to go back onto sale by auction, presumably by the Duchy of Lancaster. Hopefully the Trust can find a sympathetic future owner for partnership with a view to bring the Listed Grade II building back into use. Edinburgh’s Capitol Theatres has announced ambitious refurbishment plans for the King’s Theatre in the Scottish capitol. Not by Frank Matcham, which is the Glasgow Kings, but the only surviving operational theatre by John D Swanston with James Davidson, built in 1906 and now heritage Listed Grade A. The initial designs by architects Bennetts Associates can be seen here. Just days after the Burnley Empire Theatre Trust campaign announced support from the National Trust for its plan to reopen the long closed Bertie Crewe theatre, a fire broke out overnight. This has the appearance of deliberate arson and is being investigated. The Theatres Trust has launched a new promotional video with contributions by their ‘Ambassadors’. View it here on YouTube. 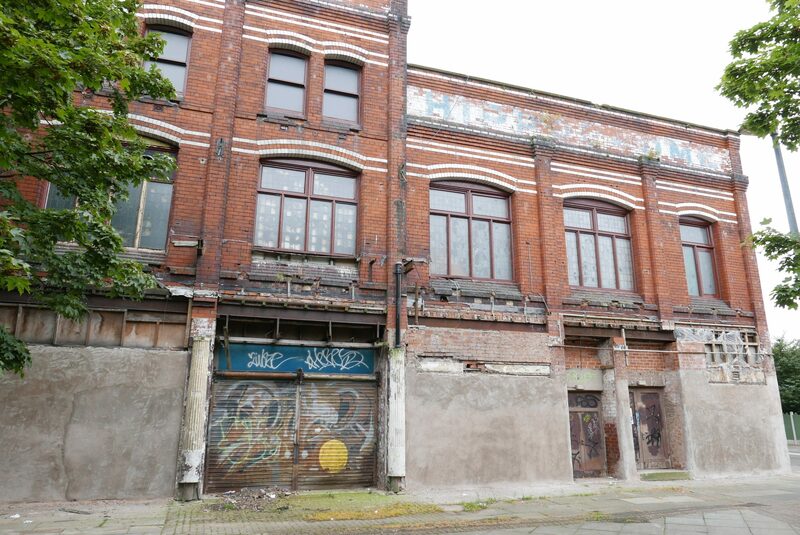 The Salford Victoria Theatre Trust are concerned at the sudden announcement that the long boarded up Grade II Listed theatre is to go to auction. More can be seen on their Facebook page here. Scroll down their page for plenty of photos. The Historic England listing description when on bingo is here. UPDATE: in the event it didn’t sell, but subsequently went to an as yet unknown buyer. 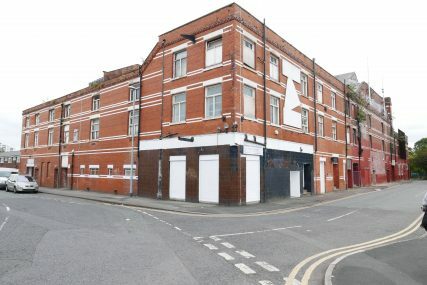 What next for the fine old place close to the city centre and Salford University media school. Please view and sign their petition here. The Save Our Hippodrome campaign in Brighton has released a draft report commissioned by Brighton & Hove City Council for the revitalisation of the Old Town Conservation Area with important provisos for the treatment of Matcham’s at risk Hippodrome. Follow this link to view the report and see the relevant sections 7.71-7.73 on page 22 and section 8.9 on page 25 and also our Theatres at Risk page for more. OISTAT50 (International Organisation of Scenographers, Theatre Architects and Technicians) at Cardiff this year, is launching a workshop for Heritage Theatre Techniques in Contemporary Scenography under the direction of theatrEurope and Jerome Maeckelbergh, a spin-off from the successful Wood & Canvas in Antwerp, which came from the active support for the Bourlaschouwburg, the last remaining municipal theatre in Europe with original stage machinery. More details here. Matcham’s amazing Liverpool Olympia recently announced a new partnership with Eventim for naming rights and ticketing which should bring immediate benefits of more bookings and possible improvements hinted at in the press announcement. Chris Zorba, who has successfully operated this big theatre over many years says that the partnership “will fulfil the vast potential of this unique venue.” The Eventim Olympia website is here. Angel Sharp Media premiered the documentary feature about Frank Matcham ‘Bombastic Rubbish – The Theatres of Frank Matcham’ at the London Hippodrome on 18th June. It was selected for inclusion in the Architecture Film Festival in Rotterdam in 2017 and the makers kindly invited the Frank Matcham Society at attend the viewing of this entertaining piece about his work. Don’t just take our word for it, click on the image to play and enjoy the video. Peter Blake created an image of Matcham’s sadly lost Chiswick Empire and its cast of characters for the wonderful Chiswick Timeline project which is a giant historical map now unveiled and in place under the bridge at Turnham Green station on the District and Piccadilly Lines. If you can’t hop off the train to take a look, read about it here or buy the print or try the quiz. The Lyric theatre in Hammersmith, with its Matcham 1895 auditorium reconstructed as its main space inside a modern office block, has announced that the auditorium is to be refurbished along with its studio. The work will carried out following a late June closure and it is scheduled for re-opening early October 2018. The venue recently completed significant work and extensions to its ancillary spaces. More information and video here. 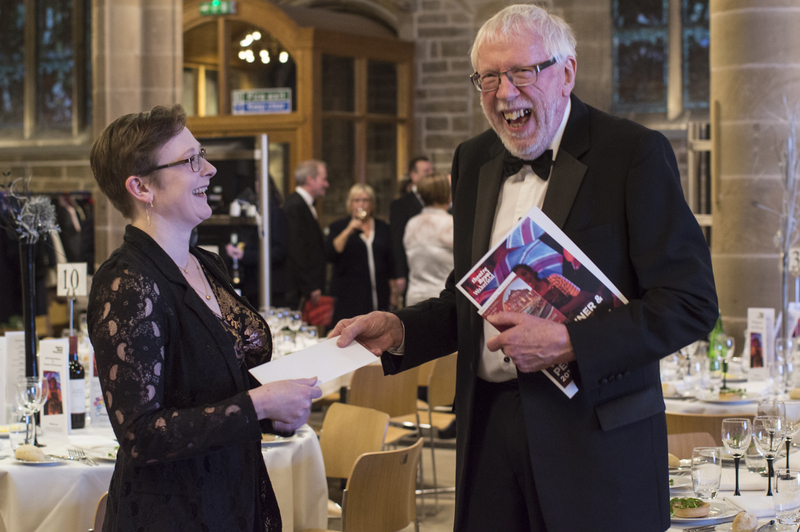 Matcham’s Wakefield Theatre Royal held a gala fundraising dinner at the Cathedral in aid of the theatre’s new Centre for Creativity, and our own Murray Edwards presented a cheque to Katie Town, the Executive Director. Look for our star inscribed ‘Frank Matcham Society – Founded at the Theatre Royal, Wakefield, in 1994’. Find out more here. Our Chairman Mark Fox says of Sir Ken Dodd OBE: We woke today to the sad news of the death of Sir Ken Dodd OBE following his recent ill health. It was an honour to have him as our Patron. He will be greatly missed by his legion of fans and all the theatres across the country that he worked in regularly for over six decades. 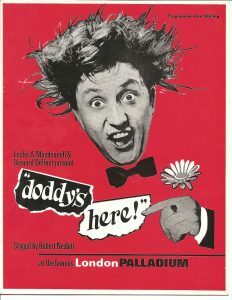 Both Palladium seasons in the sixties broke box office records. It was Charles Henry, Stage Director, who threw his keys onto the stage during one performance telling Ken to “let yourself out” ! 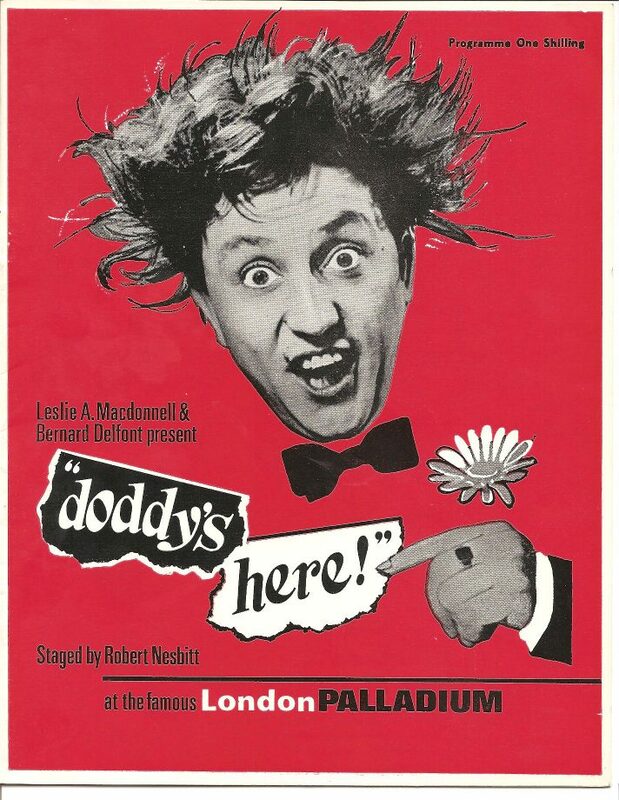 UPDATE: We are sorry to hear that our patron Sir Ken Dodd has passed away. He had long been a supporter of traditional theatres and was a patron to many. He will be missed, but with so many happy memories for us all. Read the Guardian piece here. The Theatres Trust launched their Theatre Buildings at Risk Register (TBAR) 2018 list today (23/01/2018) widely featured on broadcast and social media. 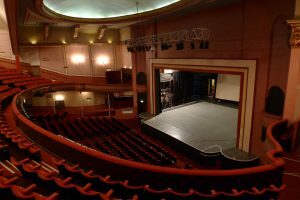 It shows Brighton Hippodrome still at number one, Margate Theatre Royal a new entry at number two, and Streatham Hill Theatre South London also a new entry at number seven. Three have gone: Scarborough Futurist soon to be demolished by the council, the Historic England listed Pier Pavilion theatre at Colwyn Bay being dismantled, and the Royal Victoria Hall in Southborough Kent, also recently demolished by the council owner. Although still listed at nineteen, the Coronet Elephant & Castle closed New Years Eve after 138 years and is set for demolition by Southwark council’s redevelopment contractor. It should be noted that of the four losses (two gone and two imminent) two were carried out by councils who were also the theatre owners, and two by council’s action against private owners that wanted to keep their theatres and fought the council decisions but lost. 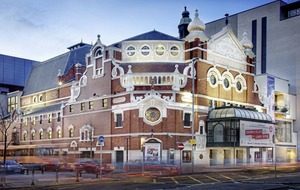 There will be a talk on the wonderful, but at serious risk, Brighton Hippodrome on the evening of Thursday 15 February 2018 to be presented by David Fisher who is chair of the Community Interest Company (CIC) and leading light in the Our Brighton Hippodrome campaign. Download the flyer in PDF format here Brighton Hippodrome Talk flyer. An eagle eyed new member has spotted our plaque on Matcham’s Kings Theatre in Southsea on Michael Portillo’s Great Rail Journeys – Episode 4 Series 9 “Chichester to Cowes”. This is still available on iPlayer here (at ten minutes in) and well worth viewing for the good views of this magnificent theatre, inside and out. Belfast Grand Opera House announced its next stage of the refurbishment project, which will commence in January 2020. The Heritage Lottery Fund has given its support to the project which will mark the 125th anniversary of the opening of Frank Matcham’s opulent theatre. The Irish News online has a feature here. 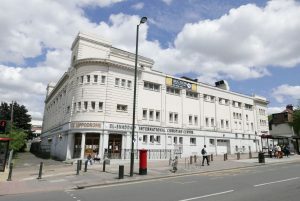 Brighton’s long standing MP Caroline Lucas has said that the proposed transformation of the Hippodrome into a luxury hotel would be a tragedy. The Green MP for Brighton Pavilion said the venue in Middle Street , Brighton, could and should be central to the regeneration of the Old Town, reports The Argus local newspaper online. 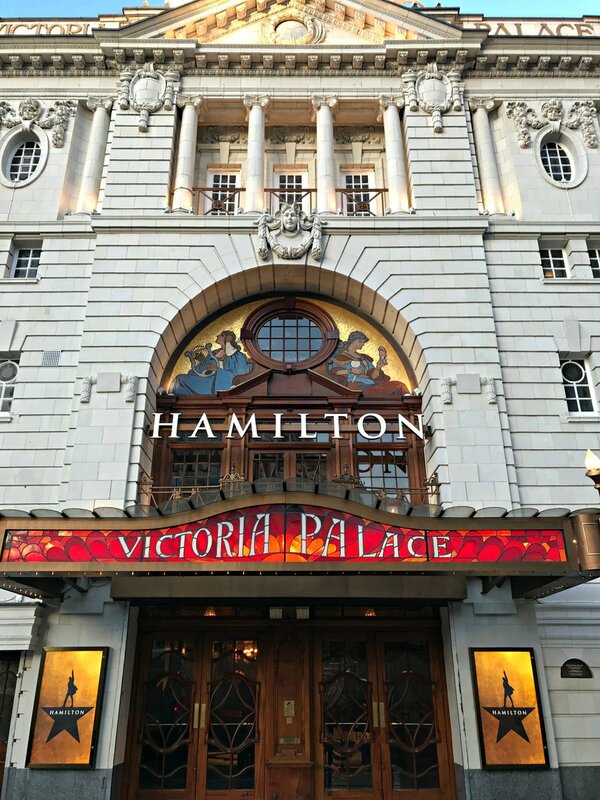 London’s Victoria Palace (Frank Matcham 1911) has re-opened for previews of Hamilton, and both the show and the restored theatre are getting great reviews. The facade is sparkling and easily outdoes the new buildings that now surround it. The re-seated and redecorated auditorium gets a mention here, with work ongoing for the enlarged stage-house now in progress. Coincidentally Sky Arts played the Billy Elliot live recording on Christmas Eve with some atmospheric views of the earlier interior and to the cheers for the line-up of past Billy’s for an encore. 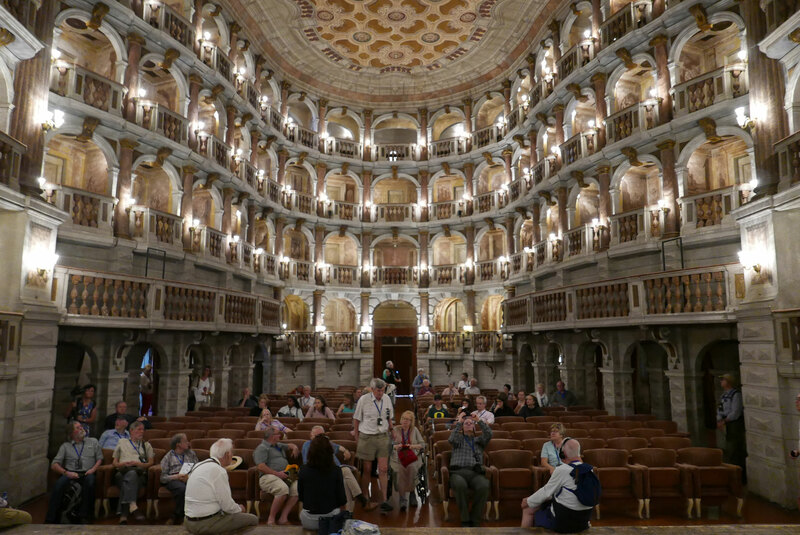 There’s a fresh new website for the European Route of Historic Theatres, now featuring the long awaited French historic theatres and others in the Alpine, Adriatic and Baltic regions, and more. 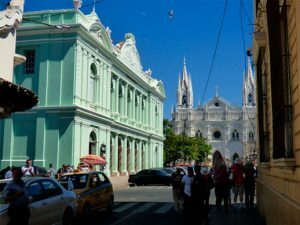 There is now information on tour partners and do not miss the Database listing of almost three thousand unique, beautiful and charming theatre buildings. Grammy-award winning singer Sam Smith croons his way around the hallways of the London Palladium in new video, ‘One Last Song’. Directed by Joe Connor, the music video was shot on 35mm in a single take. It picks up as Smith steps off the stage of the Grade II* listed performance venue, built by Walter Gibbons in 1910 and designed by theatre architect Frank Matcham. 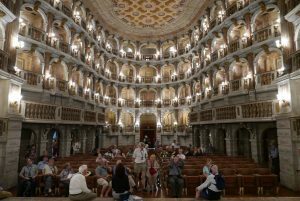 Whatever your taste in music, the fabulous Baroque interior of the Teatro Bibiena in Mantova makes a great setting, and with a big stretch of the imagination it could be the Matcham Society on the visit in this video by Google Culture. The photo is of a recent visit by another theatre group. BRIGHTON HIPPODROME: LATEST The local Brighton Argus online newspaper reports that Academy Music Group has completed the sale of Matcham’s iconic Grade II* Hippodrome to developer Mosaique whose chief executive Aized Sheikh announced plans for a development of a boutique 5 star 70 bed hotel, 25 high end serviced apartments and a concert, theater[sic], conference and banqueting venue. The CIC and local campaign have welcomed the end of a long period of doubt over ownership. Also see our Theatres At Risk page here. 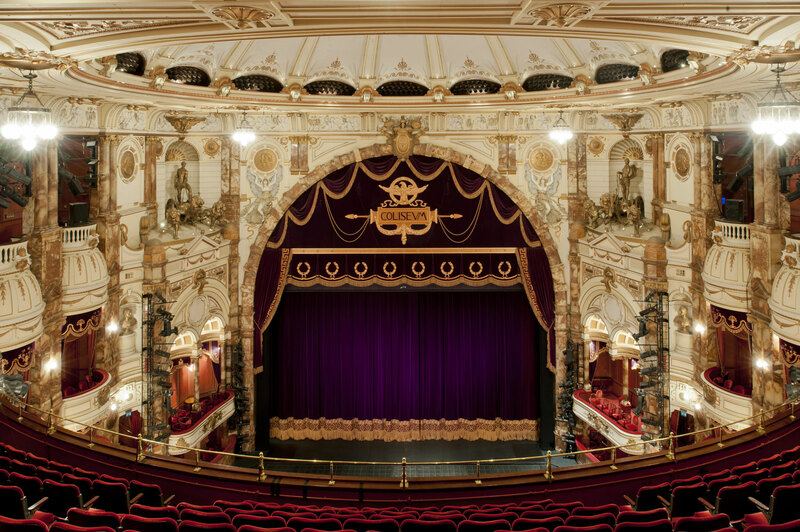 The very first Historic Theatres Day was marked by many theatres, the Theatre’s Trust, Visit Theatres and the Frank Matcham Society, who in association with the V&A Theatre and Performance Collection, presented ‘Frank Matcham’s Masterpieces on Film’ by Richard Norman. This almost filled the museum’s large lecture theatre and was a great collection of film clips that Richard had put together to illustrate Matcham theatres used on location, many gone, some surviving and one – Brighton Hippodrome – in peril. Note the date in your diaries: 25th October 2018. 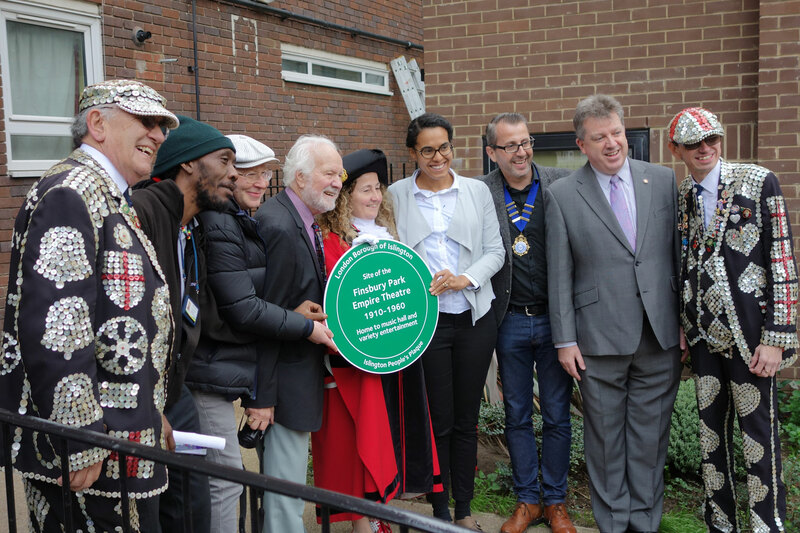 The local people of Finsbury Park in Islington North London have not forgotten the Empire theatre and voted to place a commemorative plaque at the site. It was designed by Frank Matcham, opening in 1910 and closing in 1960. Various uses followed until demolition in 1965 for housing. 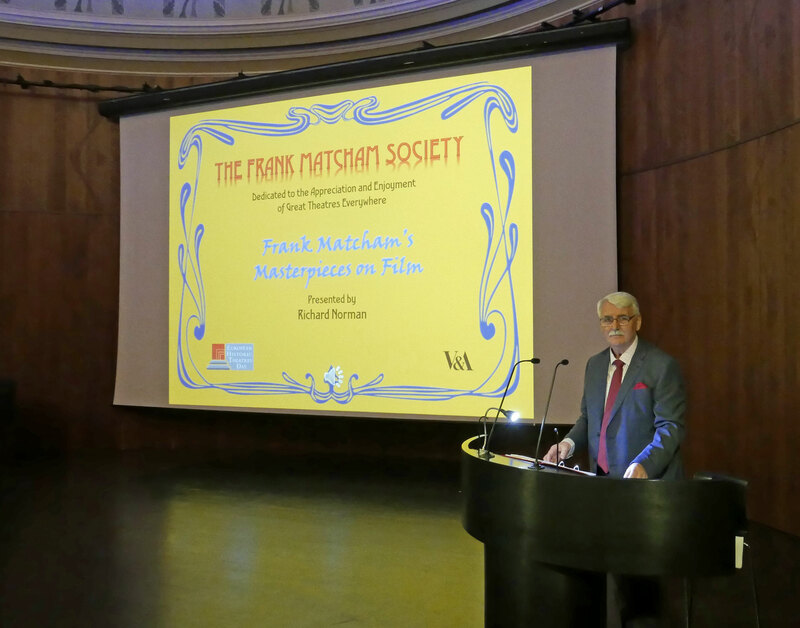 The Frank Matcham Society was represented by our Chairman Mark Fox. Southwark Coronet, originally the Elephant & Castle Theatre by Frank Matcham, closes its doors for the final time on New Year’s Eve, 2017 prior to demolition for an office block. The final play to be performed in the theatre, for one night only, will be The Melodramatic Elephant in the Haunted Castle. A partnership with the Coronet, Southwark Playhouse and the Arts Council, the production poignantly dramatizes the intertwined fate of actress and theatre. Tickets are free – more information and booking here. Scotland’s oldest working theatre is celebrating 225 years. Opened in 1792, it was built by Thomas Boyd and extended by C J Phipps in 1876, and is now Listed Grade B. Much altered inside, the exterior is recognisably that of Phipps. The Theatres Trust, SAVE Britain’s Heritage, the C20 Society and the Cinema Theatre Association have all lodged formal objections to the demolition of the Scarborough Futurist. This iconic venue is to be replaced by a theme park apparently, all at a cost of at least £4m and almost twice the cost of re-opening it. The Borough Council will decide on 5th October. Local campaigns have been fighting the plans but need more support. 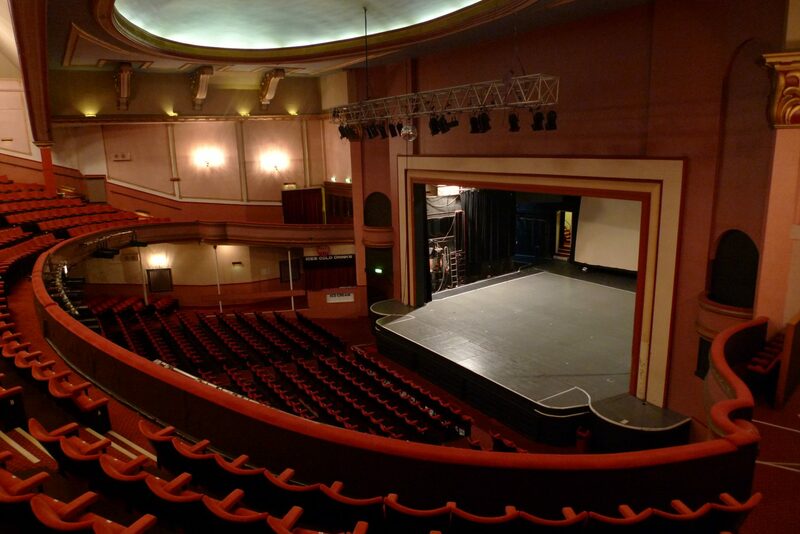 The Scarborough Futurist was a well equipped theatre in good condition when the Council closed it in 2014, with a deep, wide stage and full flying facilities, that can seat 2,155, the last one left in the town by local architect Frank Tugwell, who also designed York Theatre Royal and London’s Savoy Theatre. The site is currently subject to a planning application for demolition. The local campaign and the Theatres Trust have objected to the demolition, and would urge you to as well. The Theatres Trust has recently highlighted the plight of the Grade II* Plymouth Palace. This is a theatre building of outstanding architectural quality, and one of Plymouth’s finest surviving Victorian buildings. The building is currently no. 2 on their Theatres at Risk register and also features on Historic England’s Buildings at Risk register. We saw it in 2016 but the charity carrying out the rescue work failed. A Change.org petition has been launched to resume talks on future of Plymouth Palace. London’s Open House open days for history, culture and architecture in the capitol, includes plenty of theatre buildings both old and new. A recent search found Matcham’s Hackney Empire leading the must see options, with many of our favourites both old and new. Search again nearer the event for late entries. 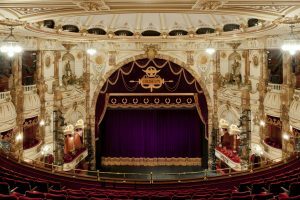 The annual Heritage Open Days is imminent and a quick search of the listings in England finds plenty of theatre buildings including Matcham’s New Theatre Royal in Portsmouth and the Theatre Royal in Newcastle upon Tyne. Scotland has its Doors Open Days with the Matcham Glasgow Kings amongst its theatre offering, and Wales has Open House with just a few theatres listed, but search nearer the time for late entries. 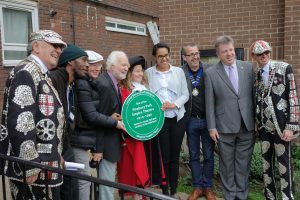 By popular vote, the London Borough of Islington is to remember Frank Matcham’s Empire theatre with a People’s Heritage plaque (not blue but green like our own plaques). 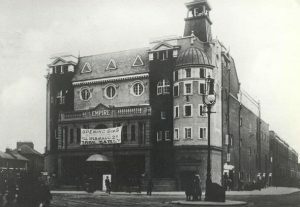 This was one of Moss Empires largest theatres and it became the try-out hall for the variety acts before they went on tour at all its theatres, and there were many. It opened in 1910 but struggled in the post WWII period, and it closed in 1960. It was used as a scenery store, film location and rehearsal space before demolition in 1965; full history on the Arthur Lloyd website. Photo: Cinema Treasures. Interestingly, the other side of the tracks is the new Park Theatre which has replaced an office block. Nary a mention of the Empire in its publicity but apparently a panel from the original Matcham Lyric Hammersmith is inside. The Manchester Evening News reports some local activity to get the Hulme Hippodrome (1901 by J J Alley) back into community use. It is possible that there is some confusion with its adjoining twin Playhouse theatre, see news item below, of similar layout but different interior decorative scheme, and which was sold at auction earlier this year. However, the accompanying YouTube video is the Hippodrome, then and now, and fascinating viewing. Booking is already open for the Theatres Trust Conference 17: Theatres & Placemaking which will hopefully bring together theatre operators, local authorities, planners, developers and architects to explore the role of theatres within placemaking. Placemaking is at the heart of building thriving communities and promoting well-being. Although a well-established concept, it seems often forgotten when car parks and flats are planned to replace a theatre, thus removing the reason for people to go there. Conference information here. The Irish News online reports that Matcham’s Grand Opera House in Belfast is to have a three month spruce up of the exterior of this fine theatre. During the works, the venue will remain open for business. The best online theatres resource by far, the Arthur Lloyd website, has reformatted and re-organised its index and page structure to suit the latest tablet and smartphone platforms, but maintained the extraordinary depth of content. Our links go to the Frank Matcham index, but be sure to explore the rest of the site. 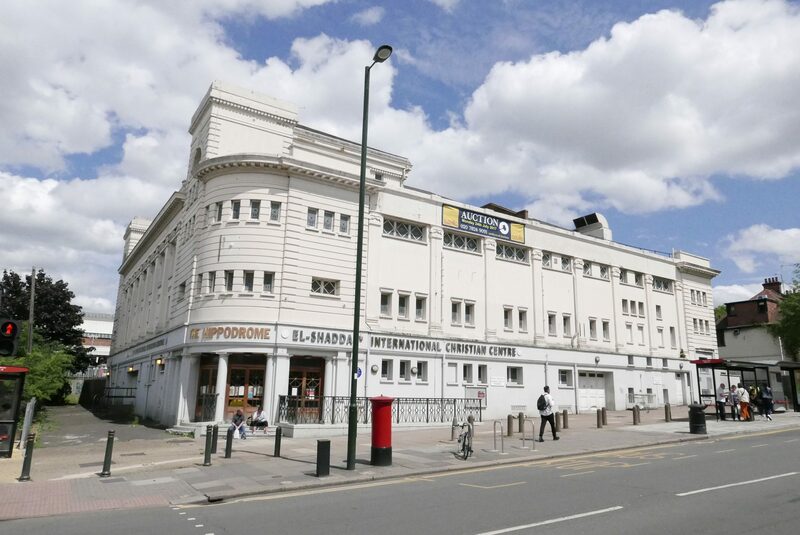 Golder’s Green Hippodrome of 1913 and by architect Bertie Crewe Listed Grade II is going for auction Monday 24th July, so pop along and bid if you have a bob or two. The BBC operated it for many years as a radio and TV studio and a church has been in residence in recent times. The auditorium is said to be in good condition having been partially re-seated and decorated by the church. This part of North London is without a large theatre. Postscript: it was sold to a Muslim faith group reports The Stage. Nice video from the Kings Southsea outreach project Theatre of War – Kings Theatre with images from their archive for Frank Matcham interest. Thanks to the British Music Hall Society for sharing via Twitter. Click or tap on the YouTube image for full screen. The Theatres Trust has updated its website and has more information on its archive and library online catalogues useful to researchers. Take a look here. Nottingham’s Theatre Royal first in a new series of public events that forms part of ‘Theatre Royal Nottingham: Its Stories, People & Heritage’ a two year project funded by the Heritage Lottery Fund that will explore many aspects of its past, is a free talk by our Vice President Rupert Rhymes OBE ‘Frank Matcham: His Life & Career’; more information and book here. The ABTT Theatre Show – 2017 is at London’s Alexandra Palace 6th & 7th June featuring the technical side of current theatre production. Free registration is online or pay on the door once the exhibition opens. There is the possibility of short back-stage tours of the Victorian theatre currently under restoration; not bookable in advance. For those interested in the use of heritage designs of stage machinery in the modern world and who may have experienced the seminal Wood & Canvas presentation in 2014, OISTAT the International Organisation of Scenographers, Theatre Architects, and Technicians ‘World Stage Design 2017’ in Taipei, Taiwan should check out ‘Heritage Theatre Machinery: unexpected possibilities in contemporary productions’ lecture with Jerome Maeckelbergh – more info here. The V&A Theatre Collections has added some new displays recently, including costumes, set models and a feature on the historic theatre tours of Europe, many of which the Frank Matcham Society has itself visited on its international tours, but most can be toured by the public. There is a link to the V&A here and the European Historic Theatre tours here for more information. Hackney Empire will be unveiling a Walk of Fame on Thursday 25th May at 3pm. Since this venue has seen most of the famous names in entertainment during its incredible history, it’s bound to be a memorable event. 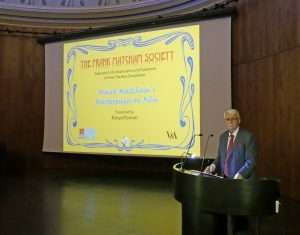 The Frank Matcham Society will be represented by many of those that helped to save the venue from being lost to the local people that now take part and enjoy its new place in the community. Mark Shenton in The Stage theatre newspaper writes an interesting piece on the ‘experience economy’ as it relates to theatre offerings, particularly in London and Manchester, but evidenced elsewhere in the UK and as expounded in the Guardian recently. It is staggering the number of new theatre venues opened recently or planned, but a shame that there isn’t a nod to those at risk outside London, especially around Manchester (see below). It is very sad to report that the Hulme Playhouse is up for sale at auction following a local report that the resident church was unable to meet its financial commitments. This is the ex-BBC studio and ‘twin’ to the Hippodrome, joined together in one block but completely different internally. The site is nearby huge university and college developments, but this appears to give no benefit to the community. The Frank Matcham Society recently visited and had been impressed by the Reverend Charles’ efforts bringing the building back into use. We must hope that there is another godfather out there, who will buy it; see auction details. The Royal Opera House at Covent Garden has added an immersive 360° orchestra pit Guide to Our Orchestra with clickable views from and around the full orchestra conducted by ROH Music Director Antonio Pappano. As well as choosing your viewpoint, you can also look at the auditorium. It may be a little hesitant to load but try again. ArchDaily has thirty cut-away drawings of concerts halls and theatres illustrating acoustics in auditoriums, should you wish to design your own, enjoy this building type, or just like to view building plans; Liverpool Everyman and London’s National Theatre included. Also see their detailed article about the Hamburg, Herzog & de Meuron designed, Elbphilharmonie mentioned in a previous post. Theatres Trust news page also mentions local reports that the fine Golders Green Hippodrome (Bertie Crewe 1913) has suddenly closed. It had been in use by a well supported church group, but this use appears to have ceased and for sale by auction notices are affixed to the exterior apparently initiated by the Department for Communities and Local Government – curious. The BBC had owned the property through the 1960’s and into the 1980’s when it was used for TV and Radio and as a base for its concert orchestra and it was well cared for. More information in the Ham & High piece here. 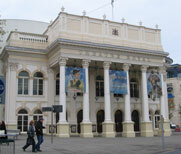 Theatres Trust reports that the long hoped for Plymouth Palace restoration plan is in tatters as the charity has quit. The Matchams visited in early 2016 and saw significant progress on this special place for the city, but apparently the finance ran out and the owner has taken back the property. More information in the Plymouth Herald piece but no word yet on what happens next. The Theatre Royal Wakefield (Frank Matcham 1894) is making progress towards funding the long planned extension for a studio theatre and more front of house facilities for this little wonder. The project is described as the Centre for Creativity and further information is available online. The Stage reports that Rep is returning to central Manchester after fifty years, with a planned conversion of the Great Northern Warehouse. Meanwhile the Theatre Royal is just up the road, disused and awaiting deliberations of its owners who operate the hotel alongside that replaced the Free Trade Hall. Matcham’s Shepherds Bush Empire, our favourite music venue, now owned and operated by Academy Music Group, continues it’s caring stewardship of the 1903 Grade II Listed theatre with an upgrade of the dressing rooms. They have a good video worth viewing full screen on YouTube which also shows some nice views of the auditorium. 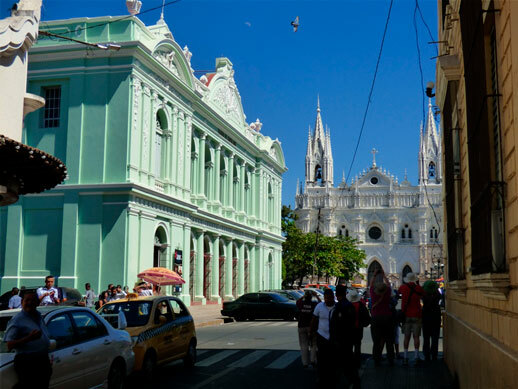 Our frequent travelers on cruise ships report that a recent shore excursion included the El Salvador National Theatre in the city of Acajutla when the Saga Sapphire docked there recently. The captain’s blog has a couple of nice photos. The Royal Opera House website has an interesting story and good images of the set for Cilea’s Adriana Lecouvreur which is a working model of a Baroque theatre based on the Margravial Opera House in Bayreuth. The Margravial is still closed for extensive restoration, but the Matchams visited the fascinating exhibition in the front of house on our international visit to Germany in May 2016. Amongst other news on the Theatres Trust website update is the disappointing information that Historic England is to recommend that the local council be granted a Certificate of Immunity from Listing Frank Tugwell’s (Savoy London, & Theatre Royal in Harrogate and York – all listed) Scarborough Futurist theatre , which is essentially a developers get out of an ‘inconvenient’ planning hurdle. The appeal period expires end February and TT is considering the next steps. The council has approved costly demolition and shoring up of the cliff despite no firm application from the theme park operator. 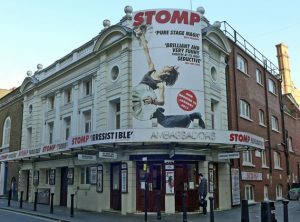 A full planning application has now been submitted for Sprague’s Ambassadors in London’s Theatreland, to be renamed the Sondheim. 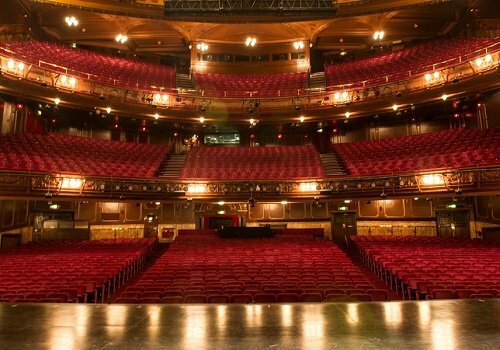 Under the enlightened ownership of Sir Cameron Mackintosh it is proposed to reconfigure the interior into a flexible space for West End transfers of alternative productions, something that cannot happen currently. The decorative elements of the 1913 Edwardian Grade II Listed structure will be re-worked into enlarged public spaces and a rehearsal room added above. See John Earl’s detailed Heritage Statement here and the Theatres Trust considered response to the application here. 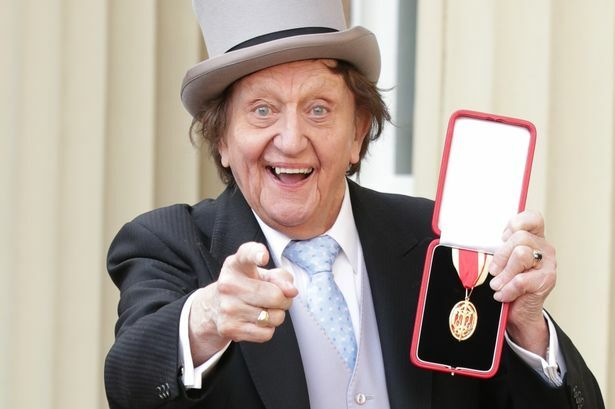 We are delighted that our Patron Ken Dodd has been knighted in the New Year’s Honours list; arise Sir Ken! We wish him, with Tim and Pru our long-time supporters, our very best wishes for 2017. For those that like a concert hall, the Herzog & de Meuron designed Elbphilharmonie is finally opening in Hamburg in January 2017. When you see the interior spaces within the extraordinary exterior on their website tour here and the fly through inside here (don’t miss the fast version by hitting the space bar) you might wonder if that is why Munich was talking about a rebuild of their Gasteig concert hall we saw on this year’s international visit. Google Arts & Culture, an offshoot of the infamous search engine, now has a ‘Theatres Lost & Saved’ section with images from the Theatres Trust Open Up! archive project recently completed. Shed a tear for the lost ones gone forever as you scroll through the pages here. At last a little bit of good news for theatres in the North of England. Burnley Empire was taken off sale by auction at the last minute after an agreement was reached between the local Trust and Duchy of Lancaster reports local 2BR and the Stage. A viability study was due to be published in the following week. The Grade II listed G B Rawcliffe/Bertie Crewe theatre had gone up the Theatres at Risk list to number five. Auditoria magazine Annual 2017 issue is available online and features one or two auditoriums that we know. Plenty for front or back stage enthusiasts and use the zoom on the good quality images. Of special interest to those researching the birth of 16th century theatre and the earliest playhouses, is the Before Shakespeare project and blog, which also features a timeline of the period and some interesting links. Our membership should note the Statute Against Vagabonds. For the researchers amongst us, the London Metropolitan Archive has a large theatre collection (linked from our Research Links page here) and runs occasional free tours to see their work in action; more information and book here. 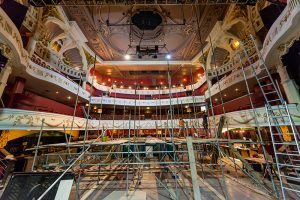 Matcham’s New Theatre Royal in Portsmouth has launched a series of ‘Behind the Curtain’ backstage tours monthly through to April 2017. The Frank Matcham Society to dispatch a couple of undercover agents to sample it. The Stage is reporting curious developments in the Burnley Empire campaign, with the theatre apparently up for up for auction by the owners. This is causing much concern locally with the Lancashire Telegraph calling it a ‘slap in the face’ here. BBC News is reporting that excavations have uncovered the first and last theatres built in Elizabethan London and that they have achieved listed status. They are thought to have been the Theatre and the Hope. The Theatre of 1576-77 and in Hackney was by James Burbage and is thought to have been the first playhouse to feature Shakespeare’s Hamlet. The Stage has more detail in their piece here. A back-stage fire at the Bertie Crewe Théâtre Mogador in Paris has put back the opening of Phantom of the Opera reports The Stage. This 1913 beauty situated in the 9th Arrondissement underwent restoration in 1983 and the interiors can be seen on their website virtual tour; be sure to go to full screen. The Theatres Trust interns have completed the cataloguing phase of their Open up! Archive Project to catalogue and share the collection of architectural plans of regional theatres, thanks to support from the Heritage Lottery Fund. Can’t wait to see this online. 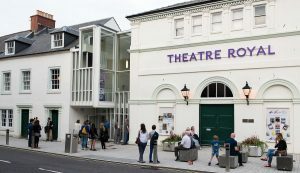 The Theatres Trust has announced its 10th annual Theatre Buildings at Risk Register. Sadly there are six new entries, including three re-entries. However, there is some progress in Brighton, Burnley and Kirkcaldy. Read the press release and view the videos from Trustee Dara Ó Briain and some of the campaigns. Find out if you can offer your support and applaud these wonderful people. Slim pickings for theatre, cinema and other performance spaces this year at London Open House 17-18 September. The good news is that Matcham’s Hackney Empire, the National Theatre on the South Bank and Unicorn in Southwark will have tours. Also the Rio Dalston and Olympic Barnes cinemas will have tours in an otherwise unfortunate year for cinema heritage. Check the Open House website nearer the dates in case more are added. The Theatres Trust current News Digest reports some encouraging signs for the campaigns trying to prevent the loss and find a re-use for the Burnley Empire, Dudley Hippodrome and Bradford Odeon, proving that a cause is never lost until its gone. The amazing Hulme Hippodrome in greater Manchester has been turned down by the local authority for Asset of Community Value status, which it surely was and could be again. Apparently restoration will be too costly and (unsaid) all the money is probably needed for the Granada site. Campaigners vow to fight on for their local treasure reports the Manchester Evening News. The Theatres Trust risk assessment is here. Matcham and Phipps’ venerable Nottingham Theatre Royal two month project to update the front of house facilities of both the adjoining modern concert hall and the main house, is underway according to the local newspaper, the Nottingham Post. London’s Notting Hill Gate Coronet sleeping beauty by W G R Sprague, imaginatively revived and programmed by the Print Room, is booking for their excellent free tours in September. Crown Theatre in Eccles greater Manchester is under imminent threat of total demolition and replacement by the usual bland six storeys of flats and retail; places to live but nowhere to go. See the Save The Crown campaign Facebook page and the Theatres Trust response to the planning authority. Academy Music Group have kindly sent an image of the work in progress – now completed – at the O2 Shepherds Bush Empire. 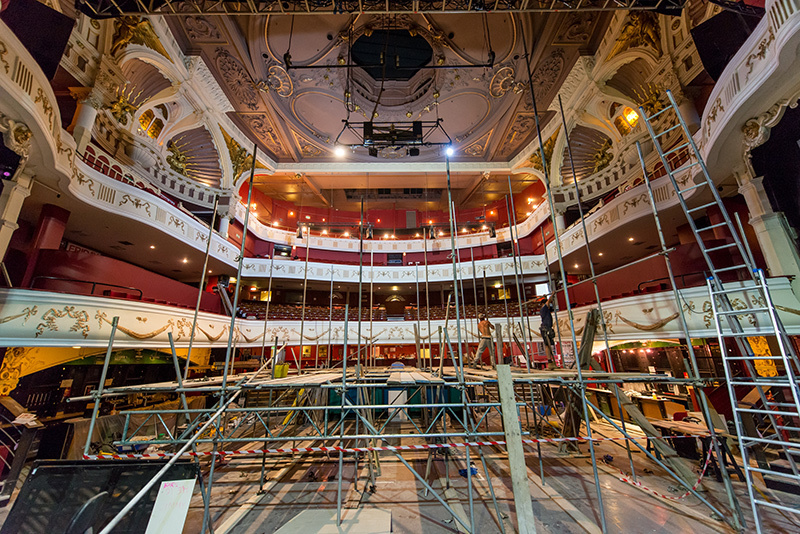 A photograph of the beautifully revived auditorium has been uploaded to our Photo Gallery. Both photos by Caitlin Mogridge and copyright O2 Shepherds Bush Empire. The Save the Crown Theatre Eccles campaign has launched a new petition to show support for re-use of this fine Grade II theatre. There’s not much left of old Eccles, and this building stands proudly on the gateway into Eccles town as the Eccles Lyceum Theatre Trust so rightly says. Support the campaign via this link. 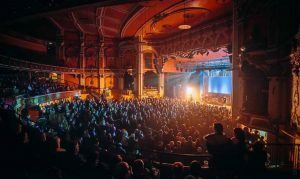 Probably our favorite London music venue the O2 Empire, or as we know it Matcham’s Shepherds Bush Empire, has reopened after a lengthy period of repair and upgrade. Keeping outer London borough theatres open is vital after so many losses from previous less enlightened times. Read the Empire General Manager’s update via this link. Burnley Empire is the town’s last and only remaining Victorian theatre and with an interior by Bertie Crewe. A local Trust is working with local authorities and The Theatres Trust to raise enough funds to schedule a viability study. The Empire is in need of urgent repair and restoration. See the Crowdfunder page and find out how to raise awareness of this theatre’s plight. The “Hairy Builder” series which follows the restoration of historic properties and shown on BBC 2 this week featured Wilton’s Music Hall in London. If you missed it, It can be watched on BBC iPlayer here. The Stage newspaper is running a feature about us under the headline “The Archive: Preserving the work of master builder Frank Matcham” If you haven’t come here from the link at the foot of the article by Nick Smurthwaite, then follow this link. The online version may require free registration or sign up for the full paid edition. Always a good read about theatre and its people. The Mail Online has published a series of interior photos by Adam Slater of Hulme Hippodrome showing the current state of gradual dilapidation of this, perhaps the most beautiful theatre interior in Greater Manchester. 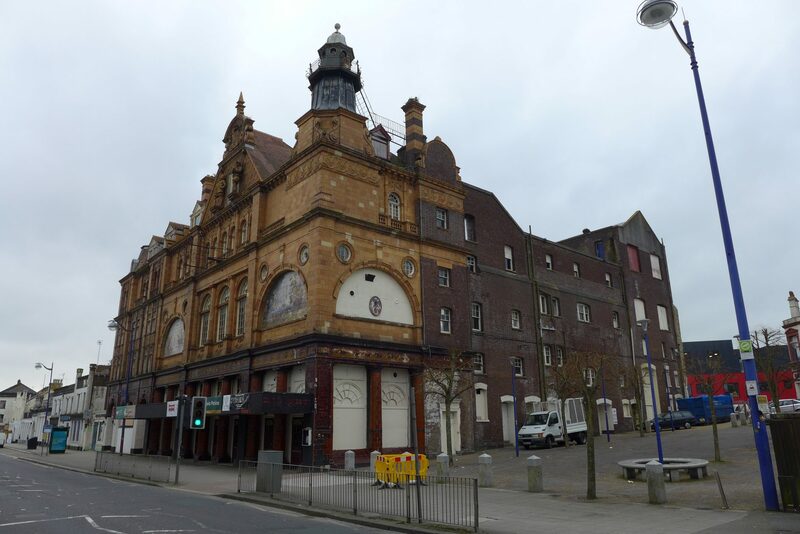 The project to rescue it for community use appears to be stalled but see the local SAVE HULME Hippodrome Facebook page via our Theatres At Risk page and the Theatres Trust Theatres at Risk fact sheet for the Hippodrome. The New London Architecture (NLA) group’s CULTURE & COMMUNITY Award Winner 2016 is the new Fly Tower roof extension at the Shaftesbury Theatre, WC2 by Bennetts Associates for Shaftesbury Theatre and The Theatre of Comedy Company – see the short list here. Also featured in the ABTT Sightline magazine recently. The Theatres Trust Summer 2016 edition of Theatres Magazine has a feature “Managing Matchams” about the particular challenges facing historic theatres, with an introduction by Rupert Rhymes and contributions from Southsea Kings & The Big Project fundraiser, and Blackpool Grand, surely two of everyone’s favourites by the greatest of all theatre architects say we. The Theatres Trust announces that Mhora Samuel is stepping down from the Trust as its Director after 10 years in the role. Rebecca Morland, currently the Trust’s Theatres Adviser, is to take up the role of acting Director pending the recruitment of a new Director. Number two on Historic England’s “Ten of the Best Gin Palaces to Celebrate Gin Day” is The Tottenham, 6 Oxford Street, London W1 listed Grade II*. When the Tottenham was built it was located a few doors down from the Oxford Street Music Hall (1893 Wylson & Long) and there is something of the palace of varieties about its interior. It is one of the best-preserved pubs in London. No direct connection with Frank Matcham, but the painted panels in its fabulous interior are by one of his favourite decorators Felix de Jong & Co. Raise a glass if you visit! Celebrity patrons actress L isa Riley, comedian Hugh Dennis, stage star Dillie Keane and singer Anita Harris have joined forces to support “Pounds for Pennies”, a campaign for The King’s Theatre Southsea which will enable the refurbishment of toilets for the venue’s Dress Circle. See the video and Crowdfunder page here. The Theatres Trust announces a Heritage Lottery Fund Sharing Heritage grant towards the cost of its “Open up! Cataloguing our Regional Theatres Architectural Archive” project. This will allow them to catalogue their collection of architectural drawings of regional theatres. Over 5,000 drawings covering 280 different theatres will be available to search by the end of the project, and to further open up the collections to those with an interest in the UK’s theatrical heritage, including the passionate groups trying to save and reopen theatre buildings, theatre managers, architects and dedicated theatregoers. The New Researcher’s Network wing of the Society for Theatre Research annual Symposium on the theme of Innovation in Performance History and Practice is on 6 July at Bristol University. STR members free admission and reduced charge for non-members attending. Bristol University is known for its Theatre and Performance Studies and the associated Theatre Collection which is one of the largest on British theatre. Full details of the NRN Symposium via this link. 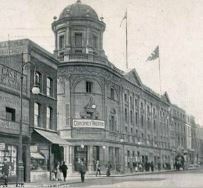 and development of both its Matcham theatre buildings and events programme. See more about this via the link here. for the protection of theatres with a new strategy and visual identity and the launch of Theatres Trust 40 programme of events. Find out more with this link here. There’ll never be another like her; Dame Zaha Mohammad Hadid, DBE, RA. Scroll through the photos here and see the cutaways. on one of their canal journeys on Channel 4. Replay link here. “Last chance saloon” for the Burnley Empire reports The Stage of the viability study and local campaign. See the new call to action by the Save the Crown Eccles campaign. Link here to run the slide show. Greater Manchester needs these theatres to rebuild its communities. Recently launched, Archiod is an online documentary channel specialising in architecture. Fellner & Helmer in the pipeline. Link here for more information. is to benefit from a viability study with help from Burnley Council following the formation of a local campaign group Burnley Empire Theatre Trust see press release link here. More on Burnley theatres on the Arthur Lloyd theatre resource website link here. 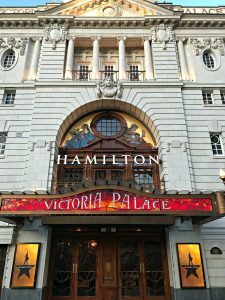 See the beautifully illustrated Victoria Palace theatre Heritage Statement prepared by our own Mark Price for the Theatres Trust follow link here. The Theatres Trust news item with a link to the full planning application papers to the City of Westminster can be seen via this link here. and some of our international visit venues follow link here. See the video by Enigma Eye of the work in progress at the Palace Plymouth, one of our March visit venues. Play the YouTube clip link here.